DeLand is a small artistic town near Daytona in Florida. 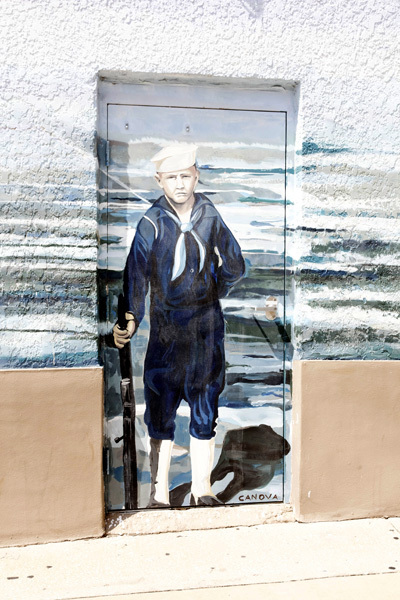 This town is full of art, quaint boutique shops of food and sundries, as well as restored buildings from the first half of the 20th century — but the murals painted on the sides of the buildings are noticed first. 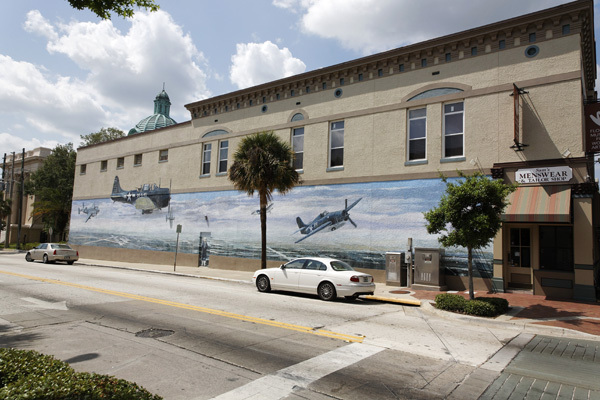 These are no simple murals since they are full of details as they portray either culture or vignettes of life in DeLand’s past as well as present. 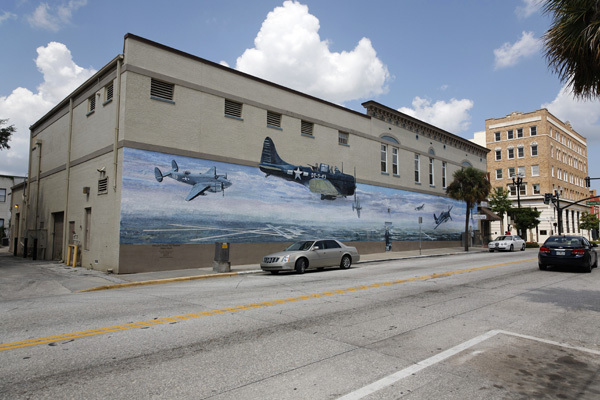 This mural is on the south face of the building located on the NW corner of US 92 and W New York Avenue in DeLand FL. 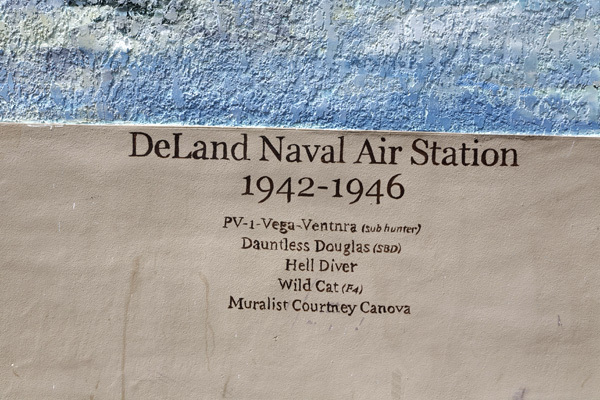 For a short time during WW II this town was also the location of DeLand Naval Air Station with the mission of training airmen in the U.S. Navy. 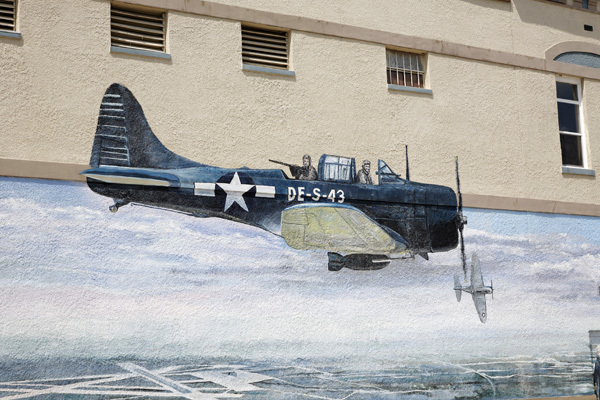 The base had several aircraft types operating from its facility and they can all be seen in a wide colorful mural done by artist Courtney Canova. His work illustrates the airfield, now DeLand Municipal Airport, the aircraft and some of the life. But there is more! Mr. Canova also brings emotion to the work with facial expressions and body language with which we can all empathize, perhaps not a rare style component among mural artists but unusual in my humble opinion. 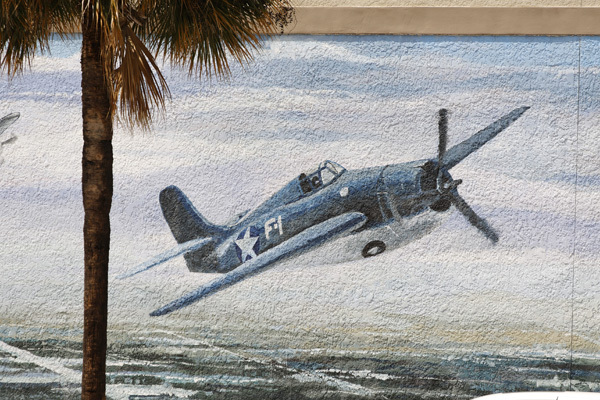 DeLand is also host to the DeLand Naval Air Station Museum which is charming. A post was published almost a year ago (though I was unaware of DeLand’s murals at the time) and can easily be found by pasting the name into the search window and selecting ENTER. You might want to quietly change Ms. to Mr. Canova. Discovered when I went elsewhere to look for more murals! GREAT shots of the mural. Am REALLY Enjoying the inclusion of additional Art…Look forward to more when you get the time.. Enjoying everything! I’ve evolved to look for the artists now so I’m learning. I’ll be posting art for the next few Mondays.